“Dr. Dino”, Resurrection Pictures’ original film project, is a biopic that dramatizes the life of Kent “Dr. Dino” Hovind, tracing his rise to prominence as one of America’s best known creation evangelists, and his eventual fall from grace due to his conflict with the IRS. The film is written by Kevin Miller, the writer of “EXPELLED: No Intelligence Allowed.” It is scheduled for production in 2011. Disturbed by the devastating effect Darwin’s theory of evolution was having on morality, religion and human worth, in 1989 Dr. Hovind founded Creation Science Evangelism to help expose the lies of evolution and introduce people to evidence for young earth Creationism. His ministry eventually took him across the country and around the globe, where he gave thousands of lectures, conducted debates with hundreds of leading evolutionists and won tens of thousands to Christ. In 2006, Dr. Hovind’s travels came to an abrupt end when he was arrested and sentenced to ten years in prison on tax-related charges. But his ministry lives on through his teaching videos and his son Eric, who is taking Dr. Hovind’s message to a whole new generation. With “Dr. 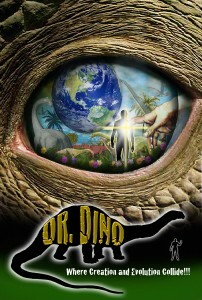 Dino,” Resurrection Pictures plans to take Dr. Hovind’s message to a new audience as well. Movies influence culture, trends, fashion, language and even religious beliefs like never before. By packaging Dr. Hovind’s teachings within a dramatic feature film, we will be creating an edifying entertainment experience that allows viewers to see beyond the deception of evolution and open their hearts to receive salvation through Jesus Christ. Here is an exerpt from the final script of Dr. Dino. Check it out!! If you are interested in getting involved with this amazing project, please consider making a donation here. Please write Dr. Dino in the comments section before submitting your donation. If you are interested in becoming an investor, please contact us for more information here. Copyright © 2009 Resurrection Pictures Resurrection Pictures is a non-profit 501 (c)(3) Christian Film Ministry. Its mission is to produce and distribute Christian movies for theatrical release with the objective of bringing people to salvation in Jesus Christ.